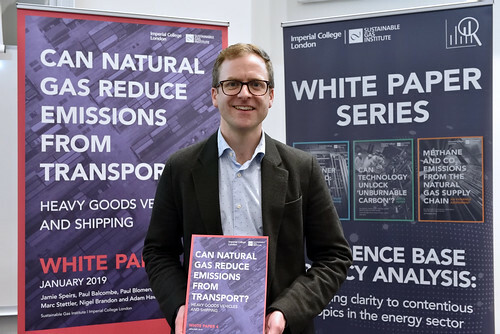 On January 2019, the fourth SGI White Paper was published, entitled ‘Can natural gas reduce emissions from transport? Heavy goods vehicles and shipping. Please find below links to subsequent press releases, articles, and presentations. Dr Jamie Speirs is the first author of the paper. Download the slides for the launch event. The evening commenced with a welcome by the Institute’s Director, Professor Nigel Brandon followed by a 30-minute overview of the report from the lead author, Dr. Jamie Speirs. For more information, see the Imperial College event page. Please find photos from the launch event on Flickr.